Sounds like a good excuse for a ride, with harbour views to boot. Now if I could just arrange so the K will tow the boat . . . I can't remember seeing in the owner's manual what the legal towing weight is. Sounds like a good excuse for a ride. Agree - Im up for it! If Cooma & the Snowies isn't too far, surely Sydney isn't! Yeah but Homebush is in Sicknee and there are places I don't go and Marg as well and I aint riding that low seat thing down there. @RicK G wrote: Yeah but Homebush is in Sicknee and there are places I don't go and Marg as well and I aint riding that low seat thing down there. 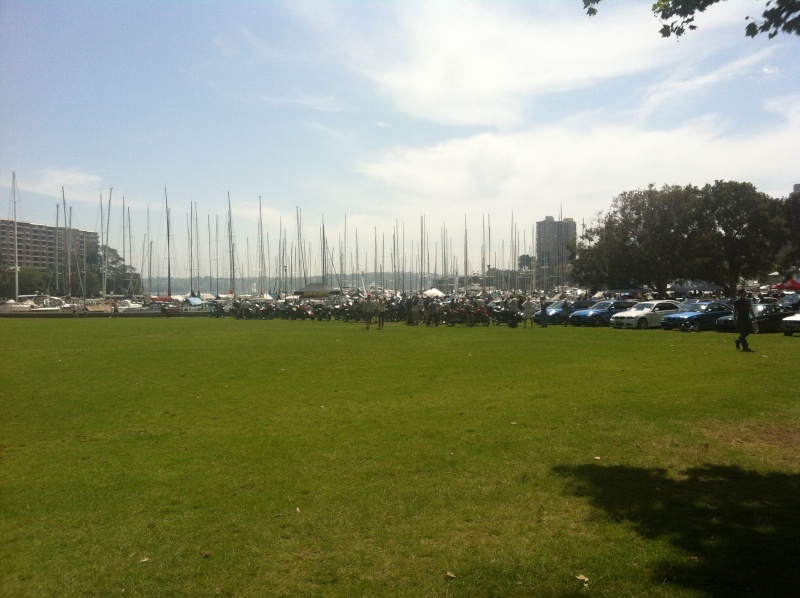 Rushcutters Bay isnt Homebush Rick. To be honest I don't ride or drive into Sydney much myself. I would not normally take a vehicle to that side of Sydney myself as the train makes more sense coming from the outer western fringes of the city. My bikes aren't pretty enough for display(and unlikely they ever will be), so thats my excuse. Just registered and paid the $5. Rushcutters Bay isnt Homebush Rick. It's still within the bounds of insanity. @RicK G wrote: Rushcutters Bay isnt Homebush Rick. True, but not as insane as Homebush. The organisers are really trying to encourage people to display bikes at the show. $5 for the day is very cheap parking near the city if nothing else I'll probably have sidecar covered in dog fur and road grime on display. They do want well used bikes as well as pristine beauties (which mine will never be). I'll probably be wearing a fluoro vest on the day too. 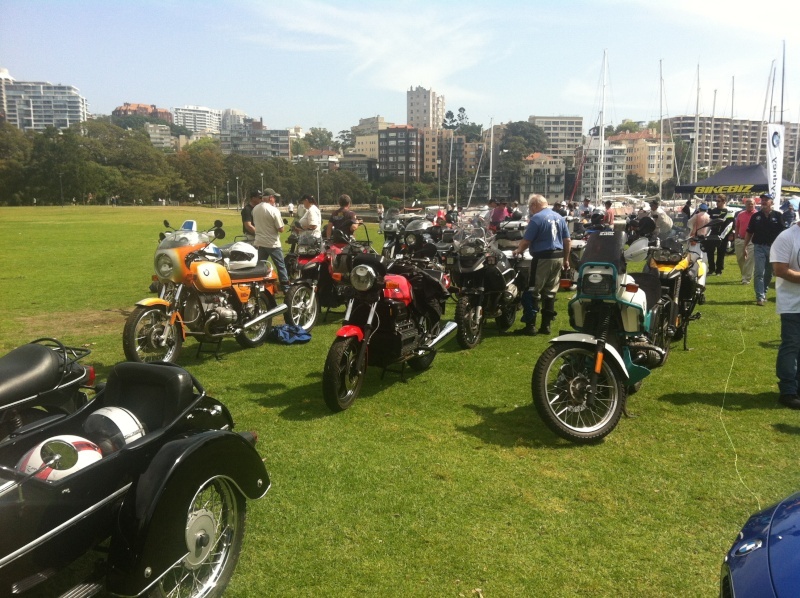 11th October at Rushcutters Bay Park. If you are interested you must go to the site below and register, there is no option to turn up on the day and enter. Please pass this information along to anyone you think might be interested. @indian036 wrote: Sounds like a good excuse for a ride, with harbour views to boot. Olaf, the power boat is about 1.2 tonnes boat, motor, trailer combined. The sail boat would probably make the weight, but add the trailer it goes up to estimated 300kg or more. 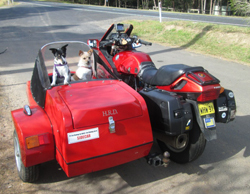 I think in NSW a trailer behind a motorcycle can't exceed the unladen weight of the bike. Neither of my boats will qualify even for that. When are you coming to Oz so I can take you out on Sydney harbour? @AL-58 wrote: The organisers are really trying to encourage people to display bikes at the show. $5 for the day is very cheap parking near the city if nothing else I'll probably have sidecar covered in dog fur and road grime on display. They do want well used bikes as well as pristine beauties (which mine will never be). I'll probably be wearing a fluoro vest on the day too. I've entered mine for the show, see you all there. I've also paid the registration fee for mine - so I can turn up and have a gander! Last reminder for the show this weekend. I'll be there in the ungodlies to help with the arrangements, look for the bloke with the fluoro-vested border collie (border patrol and rounding up strays). The sidecar has been specially prepared for the show by exposure to lots of dirt roads, dust and insects, it is at the peak of it's looks. registered as a non competitive entrant. working , so I karn't make it unfortunately , hope to see a few pics from the krew who do . enjoy everyone. Just made a late decision to go down as well. Registered the K75 as a non competitive entry (Al, I've actually removed most of the bugs from the Scrapheap Adventure run). Will look out for you lot down there. Just me back again. Went looking for a time to be arriving at the event but could not see a start time on any of the online info. Al, or anyone else going, can you help out with some info so I can plan a launch time for Sunday morning from up here in the Hunter. Gaz80 wrote: Just me back again. Went looking for a time to be arriving at the event but could not see a start time on any of the online info. The last email I got on Monday didn't have any arrival time. Thanks guys. Barring any further enlightenment I'll aim to leave up here around 7:00am which should get me there around 9:00 - 9:30am. Should be an interesting day if it doesn't rain too much. Even if it does I won't be complaining after the last few days of 36 deg C (and it's spring time). Bikes are requested to arrive between 8 & 9. Just realised I cancelled going to Tom's because of Bathurst yet registered for this. Guess they just made $5. Still on in-law support duty tomorrow, so won't be able to get there as I had hoped. Enjoy, those who do. Another good day out with great company (Note that this was not a "K" event). The weather stayed warm without being too hot - more about the weather later. 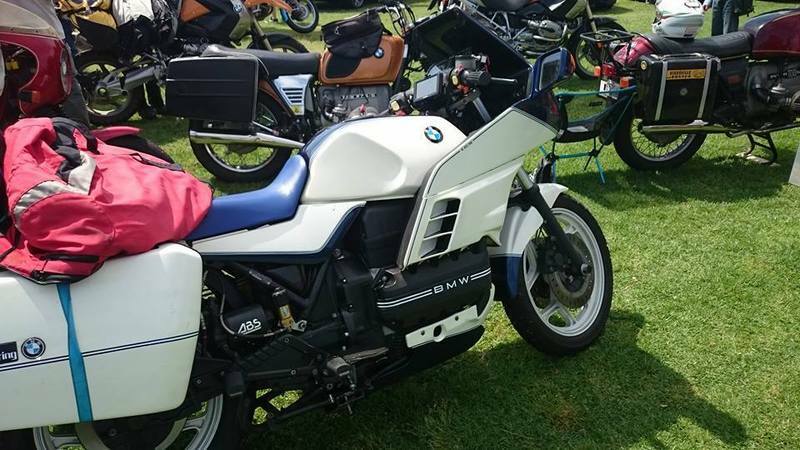 There was quite a good turn out of a wide range of BMW machinery although I suspect that the cars outdid the bikes in number but I did not do a count. Close followers on the forum will recognise some of the bikes in these photos. and despite a certain person's comments about clean or dirty bikes I noticed there didn't seem to be much crud on a red sidecar in the crowd. The Daytona Orange R90S parked near my K75 is owned by one of the two brothers who are friends of mine from way back, non forum members, and who I travelled down with for the day and it won the award for best pre 2000 R model, the other brother had his R80, R65LS and K100RS SE (blue and white which I neglected to get a photo of) all there and the SE won the award for best K model. Quite a successful day for the boys. 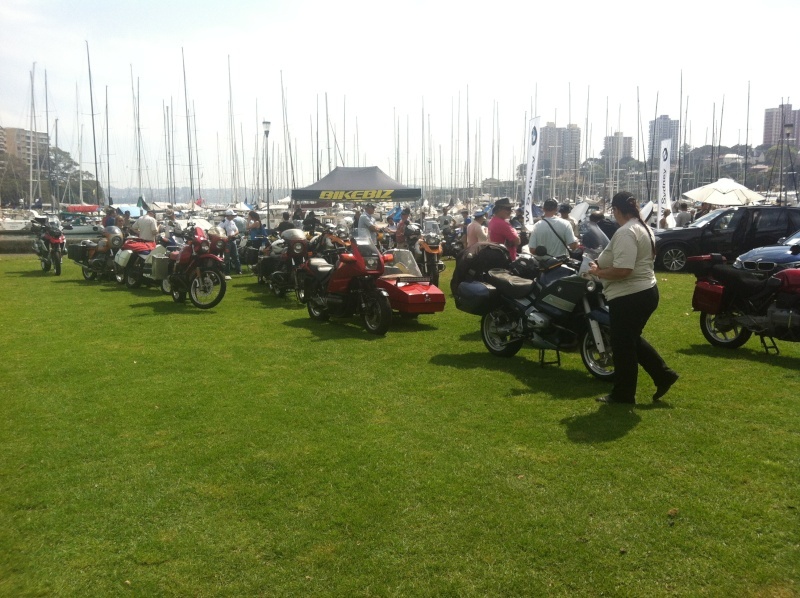 There were quite a few of the very early models lined up in pride of place along the seafront of the park. 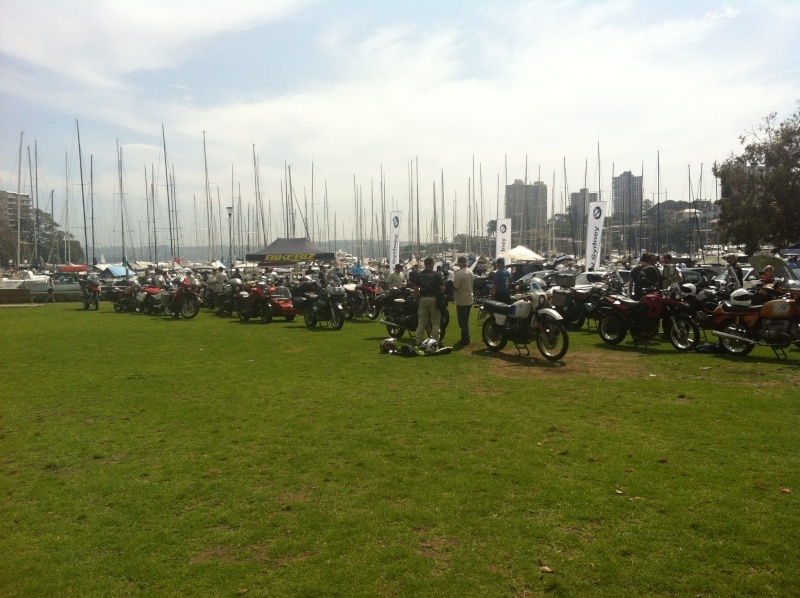 This wider angle shot shows all of the bikes with the forest of ships' masts in the background. 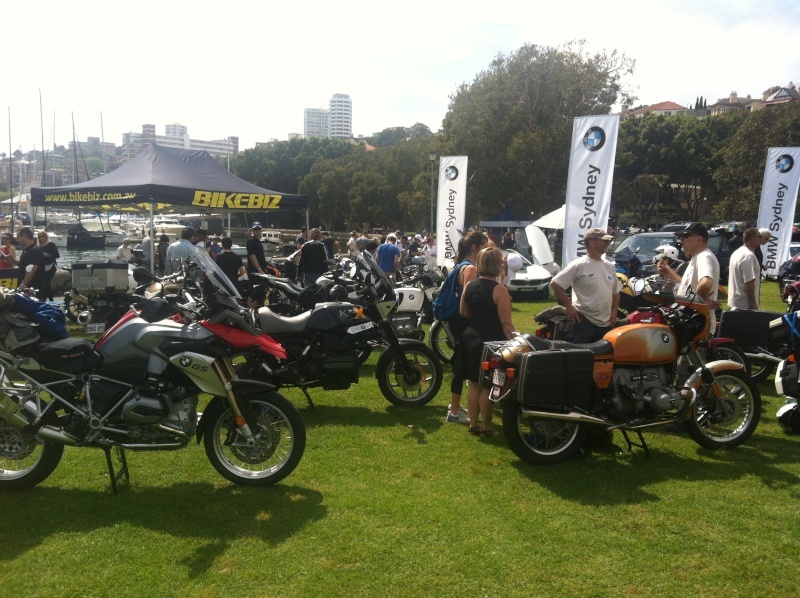 and this even wider shot shows the bikes with the BMW car entries off to the right of picture. Quite a few of the bike riders were heading off south this afternoon on the start of a trek down to Phillip Island for the MotoGP race next weekend and the weather was looking pretty stormy down that way when we left to ride home, glad that we were heading north. By the time we pulled into the service centre halfway back to home base to fuel up the smile had gone off our faces and the first drops of rain started to fall. We retreated into the cafe for a coffee as a large electrical storm started crashing and flashing overhead. A half hour later it was easing into light rain so we thought we'd head off only to find a few kilometres up the road that the storm was up ahead and not moving as fast as we were. So into the gloom we went and received a thorough drenching along with a good lightning show overhead. I had put a new tyre on the K75 front wheel on Friday and was now glad that I had put 150 kms on it yesterday to scrub it in just in case there was "some" rain. Glad to report that it felt well planted in the poor conditions. At least the rain wasn't cold. 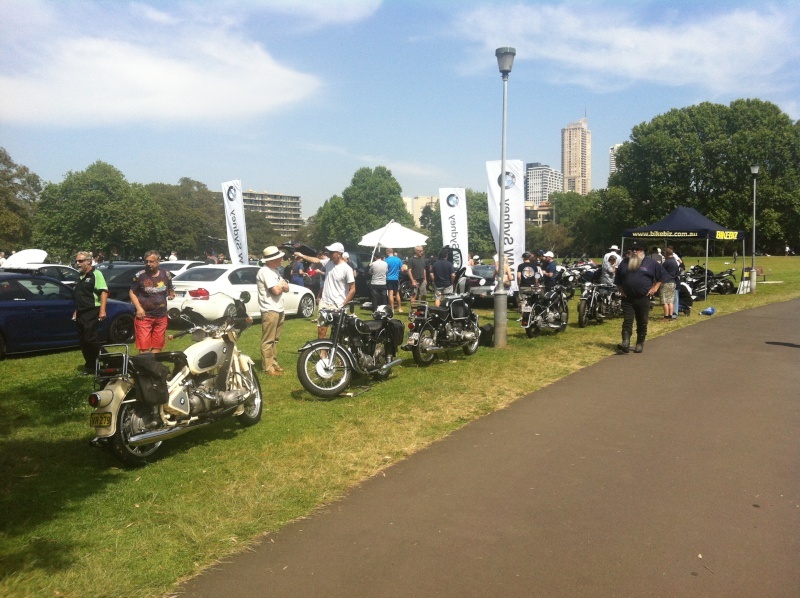 With my BMW club Vice Pres hat on I have to say thanks for coming along, it was a great day. Marie (my wife) got the trophy for best F series with her F650GS twin as well. And I got my picture of K with boat for the Photo Tag thread! The majority of the old ones(the /2 and previous) belong to one guy(Trevor), they may have been trailered to the locality but everyone was ridden to and from the show site. Not sure which old on he's riding to Melbourne but it'll be slow trip. Yes Gaz, there were many more cars. 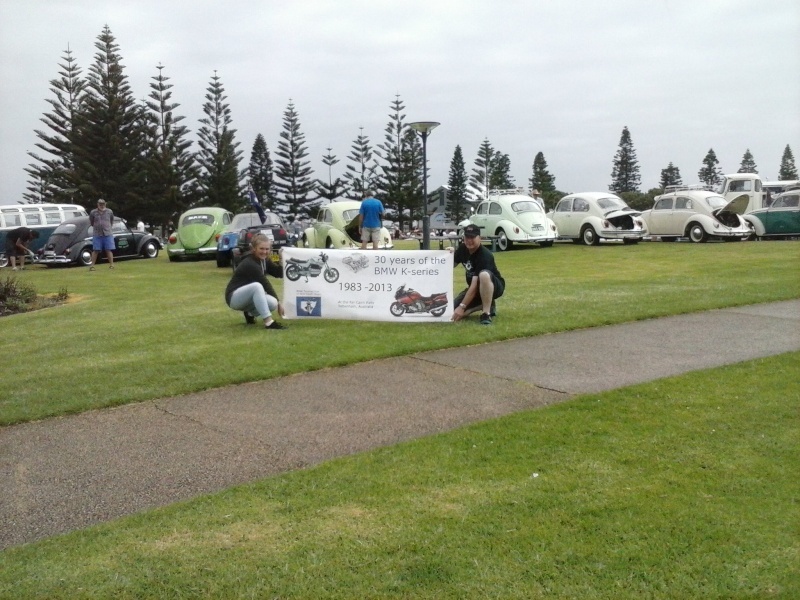 We were always expecting that, the car club have concours/show culture and they do it regularly. The bike club don't, we just ride the damned things so it was a concerted effort by many to get the bikes there. One R100RS(BM club pres)had a sad battery and needed a push to start it before leaving and the 3.0CSL "Batmobile" had major electrical difficulties and wouldn't start, I'm guessing it got towed. Great reports Gaz & Al. Good to see you there. 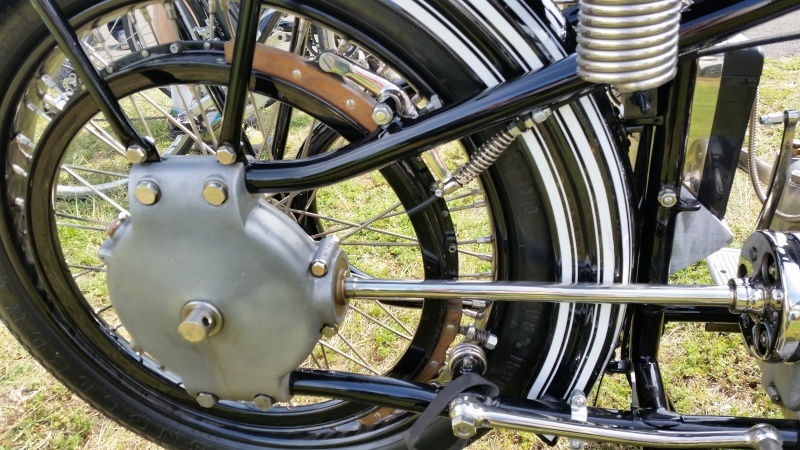 The 1923 model was incredible - wooden chock into a pully mounted on the back wheel as the only brake! There was a bloke taking lots of photos at the event. I hope you can get this show. Al , is the Zündschlüssel Run an annual event , whats the chances of another offering of K's this year? would be a good one for the sKroll to visit. popped in to the Newcastle All German Show and Shine yesterday , I was hoping to show the sKroll with Klompy's RS . Wet weather hampered his ride up . so we pestered the attendees instead. I'll have to ask Trevor, the man that pushed it with BMW Aus. It was a success, so I can imagine that they will try again, but there's been no mention so far of it as an ongoing thing yet. That said it did sort of get dumped on us pretty late in the piece last year and it was a push to get the word out. Watch this space, I'll find out. 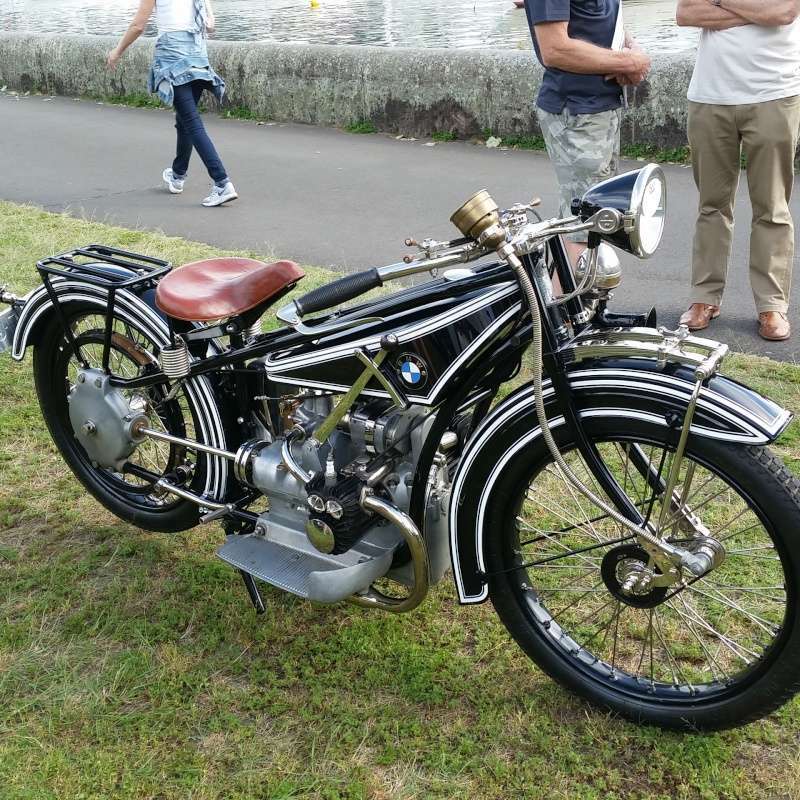 This year is BMWs centenary so you can expect some special events to be planned.